Northeastern Law School Conference on Tackling the Urban Core Puzzle. Northeastern Law School just announced a conference on the Urban Core as part of their Legal Scholarship 4.0 series. There is also a junior works-in-progress event associated with this conference (occurring on Halloween - spooky) but you better move quick because abstracts are due in two weeks with draft papers due by 9/9/15. See the website for details on the CFP and more. By examining a range of contemporary models aimed at improving worker participation, financial services, property access, economic competition and business and personal asset growth, we will explore new connections between law and development in the urban core. Farmers in northern California's Central Valley are trying to implement some of Ostrom's ideas about managing commons; in this case, water. Planet Money does a good job with the story. (The part referencing Ostrom and commons is about half-way through). Spike Lee and the City of Chicago are in a battle over the purported title of his new movie about violence in the city. Lee reportedly is using the popular slang moniker of "Chi-raq" to refer to the city's most violent neighborhoods as his title. Several aldermen proposed stripping Lee of $3 million in film tax credits, but apparently the aldermen have had second thoughts. The Chicago Tribune has the story here (note: not linked to the Tribune's website because it is behind a paywall.) Also at 2015 WLNR 22244242. A typical rather lengthy land use dispute in New Jersey highlights some of the issues that arise with exacted conservation easements. Asbury Farms, a landowner in Washington Township, New Jersey, sought to develop a chunk (chunk being the technical term for 317 acres) of its land to develop some retail areas, a golf course, and other buildings. Not provided for in the Township's general plan, the township established a Planned Village District (PVD) comprised of Asbury's land to allow the project to proceed. The PVD rules and other laws required a variety of permitting approvals. Over the course of the development of this project, Asbury applied for both permits and permit extensions as did some of the individual businesses included in the project. The interesting approval (well interesting to someone obsessed with fascinate by conservation easements) was a 10-year extension of a storm water management waiver. The Land Use Board approved the extension of the development permit/waiver in 2008 but conditioned on the Board and Asbury reaching an agreement within 6 months on a conservation easement protecting open space. The Board was worried about the loss of open space as the project was developing. 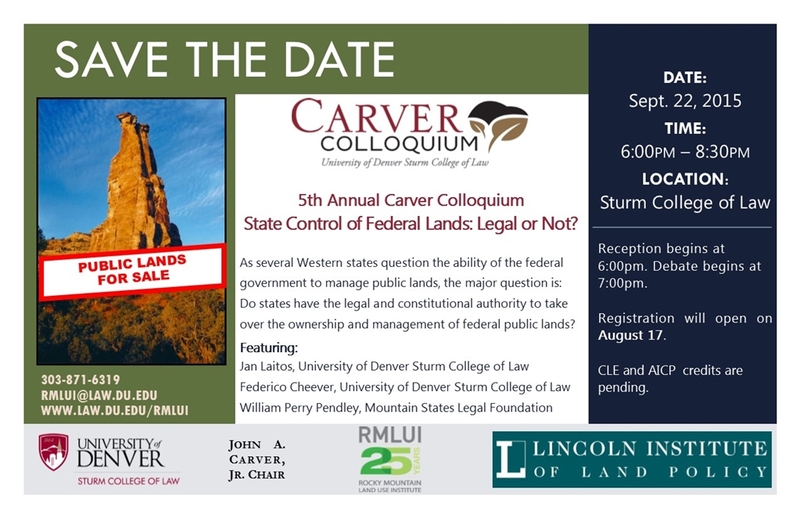 Sept 22 - Carver Colloquium at Denver Law: State Control of Federal Lands: Legal or Not? Can you enforce a conservation easement against the holder? In Rodgers v. Vilsack, (E.D. Missouri July 23, 2015), a participant in the federal Wetlands Reserve Program challenged the United States' decision to fine him for conservation easement violations. The Wetlands Reserve Program, a Department of Agriculture program administered by the Natural Resources Conservation Services (NRCS) in conjunction with state and local agencies, pays landowners to encumber their land with conservation easements with the goal of protecting and enhancing wetlands. Rodgers owns land that was formerly strip mined 3500 of the 6200 acres). In 1998, he received $1,119,00 for a conservation easement held by the United States. Although not a WRP expert, it is my understanding that sometimes the NRCS tells the landowners what restoration projects to undertake and sometimes the NRCS (or related state/local agency) actually does the restoration itself. I don't have a copy of the conservation easement itself, but we can glean some facts from the opinion. Rodgers claims that the NRCS restoration projects were faulty. He asserts that there were significant design flaws and in attempt to improve the habitat and wetlands on his land, he both created some dams and cut down some trees. NRCS fined him for both of these activities as being prohibited by the conservation easement. Rodgers, appearing pro se, also stated that NRCS gave him permission to undertake these activities. The United States brought a motion to dismiss for lack of jurisdiction because the United States has not waived its sovereign immunity for actions of this type. So many interesting things to think about here. Just sending out my annual reminder to let your new colleagues know about the junior environmental law and land use prof listserv. It's for folks who are pre-tenure or even pre-teaching. It's a great forum for informal discussions of teaching, research, how to get a teaching job, etc. Just send me an email if you want to be included. Is San Francisco's housing crisis the result of its progressivism? Let me say very clearly here that making it possible to add large amounts of housing supply in San Francisco would never have been enough by itself. A comprehensive agenda for affordability requires additional investments in subsidies for affordable housing. Given the realities of economic inequality, there are large numbers of people who would never be able to afford market rate housing, even in a better-functioning market. [See SPUR’s complete set of ideas to make San Francisco more affordable.] In addition, while my focus here has been on San Francisco’s own housing politics, many smaller Bay Area cities and towns have been even worse actors. A regional solution, in which all cities do their part to accommodate regional population growth, would be far more effective than trying to solve our affordability problems inside the boundaries of a handful of cities. But San Francisco has been part of the problem too, when it could have been a very big part of the solution. Our suburban communities never claimed to be progressive, never wanted to be a refuge for people from all over the world seeking cultural tolerance or an opportunity for a better life. In my opinion, this is the heart of the matter. San Francisco is a very small city jurisdictionally. An affordable housing policy that effectively addresses the Bay Area's housing woes must involve the surrounding suburbs. I made my analysis of the problems some months ago in a blog post I entitled, "Are San Francisco's land use rules the culprit for skyrocketing rents? [Hint: No.]." I have recently updated the conference list for land use and environmental law conferences. Always a good source to see what types of academic meetings are underway. Feel free to send updates my way. I try to update it once a month (but it probably happens every other month if I am honest). San Francisco voters will decide the fate of short-term rentals (e.g., Airbnb, etc.) in the city with a coming ballot initiative this fall, which proposes to amend the city's existing regulations. Here is the initiative and all of the relevant info from Share Better SF, which sponsored the petition. Short-Term Residential Rentals. This measure, sponsored by the housing activist group Share Better SF, seeks to restrict short-term rentals in San Francisco. The regulation of short-term rentals has been a contentious topic over the past few months. On July 14, 2015, rather than supporting Supervisor Campos’s ordinance to effectively restrict short-term rentals to 60 days per year, the Board of Supervisors voted to uphold existing law and restrict “unhosted” short-term rentals to 90 days per year and allow for unlimited “hosted” short-term rentals. “Hosted” rentals are where hosts stay in the units while guests are visiting. “Unhosted” rentals are where hosts are not present in the units while guests are visiting. If approved, this measure will cap all short-term rentals at 75 nights per year, regardless of whether the rental unit is hosted or unhosted. Conditional use approval from the Planning Commission would be required to rent a unit on a short-term basis for more than 75 days per year. If granted, the unit would have to operate as a bed and breakfast establishment. Hosting platforms like AirBnB will be required to stop listing a unit for short-term rental if the unit has been rented on a short-term basis for 75 days per year. Hosting platforms will be subject to severe penalties of up to $1,000 per day for violating these rules. Further, homeowners will be prohibited from renting their in-law units on a short-term basis. This initiative also expands the definition of “interested parties” who can sue to enforce the City’s law. Currently, only persons who live in the same building as a short-term rental unit are deemed “interested parties” with legal standing to sue violators of the law. If passed, this measure will expand the definition of “interested party” to any person who lives within 100 feet of a unit used for short-term rental, or any housing-related non-profit organization. If passed, this measure would become operative on January 1, 2016. But with the other panels of the Land Use Institute postponed, that leaves me with about 50 pages of detailed memoranda I'd created as CLE handouts for my presentations at the event that will be too dated to use at a later time. What to do? I hate to see the information go to waste, so I thought I'd post the documents here--free!--for anyone who might find them of interest. The second document provides (1) an overview of federal law and policy related to climate change since July 1, 2014 and also (2) updates National Environmental Policy regulation and case law developments since July 1, 2014. I hope these documents prove of use to some of you out there and, as always, I welcome comments, especially on what I might have missed! And don't be shy...I'd love a dialogue about any of this material either on the blog or by e-mail. And come join us at the next Land Use Institute, which is now tentatively slated for ABA's next meeting in San Diego. This summer marks the 10th anniversary of Hurricane Katrina, a catastrophic storm that reshaped the way cities across the United States and internationally talk about urban vulnerability and plan for resilience. Katrina’s Legacy conference will examine critical issues in the areas of community and economic development and educational reform. James Alexander, Housing and Economic Development manager, Atlanta Beltline Inc. Ambassador James A. Joseph, emeritus professor of the practice of public policy at the Sanford School of Public Policy at Duke University, former U.S. ambassador to South Africa, and chair of the Louisiana Disaster Recovery Foundation following Hurricane Katrina. 3 hours of Georgia CLE credit have been applied for and would cost an additional $15. When Mayor Rahm Emanuel announced two years ago he would use tax increment financing money to buy land for a basketball arena, he poked the beast. The TIF program had been widely criticized as a slush fund for Mayor Richard M. Daley. In a 2010 editorial, we called it an "off the books bonanza." So Emanuel's decision to spend TIF money on land that would benefit privately funded DePaul University provoked TIF critics who viewed the program as a clout kitty, expanded far beyond its original intent to revive blighted neighborhoods. Last week, Emanuel placated the beast. He announced the city will phase out seven downtown TIF districts. His action is an acknowledgment that the TIF program, especially downtown, has run its course. No new TIF projects will be built in the seven districts, outside of projects already approved by City Hall. The TIFs that will eventually go away: Chicago/Kingsbury, River West, LaSalle Central, Canal Street/Congress Expressway, Jefferson/Roosevelt, Roosevelt/Canal and River South. Emanuel also wants to end the "off the books bonanza" by mandating that at least 25 percent of surplus funds in healthy TIFs get redistributed to taxing bodies. He'll establish a policy on when and how to shut down TIFs. While his administration has been more transparent on TIF spending than Daley's, TIF districts, their surpluses and how the money gets transferred and spent has made the program a constant target of suspicion. In May, the Arcata City Council approved, on a 5-0 vote, the creation of a “Medical Marijuana Innovation Zone.” City officials believe it may be the country’s first-ever land use designation specifically meant to promote and regulate the production of marijuana and cannabis-related products. The 31st Annual Land Use Institute will be held concurrently with the ABA's national convention in Chicago on July 30. I'll be there and speaking on a couple topics. I've attached a pdf of the brochure. Hope to see some of you there! The webinar will be held from 1:00-2:30 pm Eastern; 12:00-1:30 pm Central; 11:00-12:30 pm Mountain; 10:00 am-11:30 pm Pacific. Refunds will not be provided for any cancellation. On June 15, 2015, the U.S. Supreme Court struck down the Town of Gilbert, Arizona’s sign code. In a rare unanimous decision, all of the justices of the Court agreed that the town’s code violated the core First Amendment requirement of content neutrality, and the majority opinion provided new insight on what it means for a regulation to be “content neutral.” The Court’s decision is expected to put thousands of sign codes at increased risk of legal challenges, which could mean increased legal costs for local governments as well as potential negative impacts on communities’ aesthetic concerns. This program will include presentations by some of the nation’s leading scholars and practitioners on First Amendment and land use issues. Panelists will discuss the facts of the Reed case, the Court’s rationale for its decision, some of the important questions and unanswered issues stemming from the case, and will provide some helpful practice pointers on sign code drafting and enforcement. On August 4th, 1:00-2:30 pm EDT, PLD will also be hosting a webinar on the recent U.S. Supreme Court decisions in Horne v. U.S. Dep’t of Agriculture and Texas Dep’t of Housing and Community Affairs v. The Inclusive Communities Project, Inc. Registering now for our “Double Webinar Package” will give you both the July 21st (Reed v Gilbert) and the August 4th (Horne and ICP) webinars for a discounted price! The 10th International Conference of the International Academic Association on Planning, Law, and Property Rights (PLPR) will take place in Bern, Switzerland, on February 17-19, 2016. PLPR is a free-standing academic association with over 400 individual members from all over the world. PLPR believes that Planning, Law and Property are interdependent. PLPR therefore conveys the message "Planning matters, Law matters, Property matters". These three simple statements inspire the growing PLPR community to examine the difficult relationship between public and private interests in the use of land. CONFERENCE THEME: "Land as a scarce resource"
Spatial planning is often accused of not being up to the tasks it is supposed to deal with: more parsimonious use of natural resources; conservation of regional identities in the face of global standardization processes; promotion of integrated transport infrastructures; reduction of socioeconomic disparities among territories, etc. During the last century, all Western countries have developed a complex administrative organization to shape their spatial development. Most countries have passed planning acts accompanied by the development of training programs for planners through national planning schools, and planning departments were created at all levels of government. In most national settings, spatial planning instruments were crafted in a context of land profusion. But are these systems able to meet the challenges of scarcity today? Senate Bill 4 (SB 4) requires an independent study to assess current and potential future well stimulation practices in California, including the likelihood that these technologies could enable extensive new petroleum production in the state; impacts of well stimulation technologies (including hydraulic fracturing, acid fracturing and matrix acidizing); gaps in data that preclude evaluation; potential risks associated with current practices; and alternative practices that might limit these risks. Publicly available information indicates the vast majority of well stimulations in California are hydraulic fracturing in four oil fields in the San Joaquin Valley. The California experience with hydraulic fracturing differs from that in other states because California wells tend to be shallow and the reservoirs more permeable. California operators generally do not conduct high-volume hydraulic fracturing from long-reach horizontal wells, and for this reason use far less water. Operators use hydraulic fracturing in a small number of offshore wells in state waters, but data on wells in federal waters is sparse. In the next few years, use of hydraulic fracturing in California will likely look much like today, both in terms of the stimulation practices and the expected number of operations. No reliable estimates exist of potential oil production using hydraulic fracturing or acid stimulation in the deep Monterey Formation source rock and the state should request a credible scientific assessment. Direct impacts of hydraulic fracturing stem from unrestricted chemical use. These appear small but have not been investigated. Significant gaps and inconsistencies exist in available voluntary and mandatory data sources, both in terms of duration and completeness of reporting that limit assessment of the impacts of hydraulic fracturing. However, good management and mitigation measures can address the vast majority of potential direct impacts of well stimulation. The state should limit the use of the most hazardous chemicals and disallow the use of any chemical with unknown environmental characteristics in order to prevent possible environmental and health impacts. Operators currently dispose of wastewater from hydraulically fractured wells in percolation pits and also likely have occasionally injected wastewater contaminated with stimulation chemicals into protected groundwater. These practices should stop. We found no documented instances of hydraulic fracturing or acid stimulations directly causing groundwater contamination in California, but few studies examined this possibility. However, we did find that fracturing in California tends to be in shallow wells, and hydraulic fractures could possibly intersect protected groundwater in a few locations. Also, California reservoirs have many existing boreholes that warrant more attention to ensure they are not leakage pathways. We found the data insufficient to determine if there is a relationship between oil and gas-related fluid injection and any of California’s numerous earthquakes, and this should be studied. Most impacts associated with hydraulic fracturing are indirect and are caused by oil and gas production enabled by hydraulic fracturing. For example, oil and gas development in general causes habitat loss and fragmentation that should be mitigated and any production facility can incur air emissions. As hydraulic fracturing enables only 20-25% of production in California, only about 20-25% of any given indirect impact is likely attributable to hydraulically fractured reservoirs. Oil production from hydraulically fractured reservoirs emits less greenhouse gas per barrel than other forms of oil production in California. Air pollutants and toxic air emissions from hydraulic fracturing are mostly a small part of total emissions in oil producing regions except for a few toxic air substances such as hydrogen sulfide and formaldehyde in the San Joaquin Valley. However, pollutants can be concentrated near production wells and present health hazards to nearby communities. California public health studies could determine the magnitude of this issue and the need for any mitigating policies. Studies done outside of California found workers in hydraulic fracturing operations were exposed to respirable silica and volatile organic compounds (VOCs), especially benzene, above recommended occupational levels, but confirmation of this issue awaits specific evaluation in California. This study highlights many recommendations to change practice, collect data, and investigate risk factors for Californians. However, questions remain at the end of this initial assessment of the impacts of well stimulation in California that can only be answered by new research and data collection. Volumes II and III of this report series provide many detailed recommendations for filling data gaps and additional research. WASHINGTON – Building on the President’s Climate Action Plan, today the Corporation for National and Community Service (CNCS), the Department of Energy (DOE), the Environmental Protection Agency (EPA), the National Oceanic and Atmospheric Administration (NOAA), The Rockefeller Foundation, and Cities of Service, announced a new commitment to launch a Resilience AmeriCorps pilot program.